The week was as crazy as I imagined it would be, and still… I managed 407 new words. Not quite the “finished something” I set for myself last week, but I figured out the plot and structure for Jasper’s Tale, and that makes me happy. So does news not quite ready for unveiling about relaunching my Red Slaves series with new cover artwork. 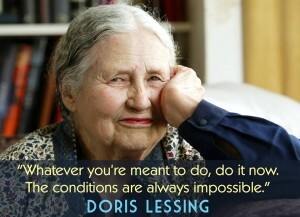 So when I saw the Mighty Girls page featuring Doris Lessing, it felt right to celebrate even those small steps by reminding myself that anything worth doing will always be impossible. Until you do it. Hubs underlined the thought by sending a link to a page with eight quotes of the Buddha reminding us that we are the only ones who know our internal road maps. Most of my day at the Symposium was taken up by a tutorial called “An Introduction to Usability Testing” by Bill Killam, who spent a lot of time explaining why psychology, with its focus on conscious and unconscious systems, change blindness, cognitive reflexes, blind spots, anchoring, priming, and reality-first biases, among other things, is the best perspective to have when trying to design interactions. I took a lot of notes, and found a few areas of disagreement, but ultimately left humbled by how easily humans are tricked by our subconscious selves into thinking our conscious selves are the ones in charge. Hubs had an answering article for that, too. To mitigate for the work-related stress and crazy schedule, and despite the high humidity and temperatures, we managed a fantastic number of walks. Long walks. On all but the day I was not home, we walked for a grand total of 14.5 miles. That app I mentioned last week upped my daily average for walking + running distance for the week to 2.24 miles. I’m half wondering at this point whether that isn’t part of why I was able to find the energy to write. Even though, once again, being away from home overnight invited some kind of sinus trouble/cold into my sphere, making my brain fuzzy for a day or two. I also managed to study… Oh the thrill of Earned Value, Planned Value, Cost Variance, and Estimates at Completion. Somehow, I am managing my time. Maybe with my small bit of momentum, I will get to done this week. Whether I do or don’t, I recommend checking in with my ROW80 cohorts while you wait for next week’s report on my progress. I’ve often said, “Even baby steps in the right direction are at least steps in the RIGHT direction.” I trust you will have a most productive week. Congrats on the physical distance covered, by the way. That’s great!